Payment Gateway - Can You Have Multiple Gateway Integrations to One Merchant Account? Can you have multiple payment gateways integrated into ONE merchant account? Well, the answer is YES, yes you can and in this video I’m going to show you a couple reasons why you would actually NEED to have more than one gateway connected to your merchant account. I’ll show you the hierarchy of how the reporting works when you connect 2 or more gateways to 1 merchant account. First off, if you don’t know exactly what a payment gateway is, click this link right here to watch the “What is a payment gateway” video where I explain in detail the difference between a merchant account, a payment gateway and a virtual terminal. Here’s a little spoiler, they’re all different so you need to know how each of them work. And it’s pretty simply to add a 2nd one, you just sign up for the gateway and connect it to your merchant account. If you are ready to do that, click the links in the description to get in touch with me and I’ll help you out. So now that you know it’s possible, what are the reasons you would want more than one gateway? In other words, you’re using a certain software that ONLY integrates with a specific gateway, and you HAVE to choose one of those gateways IF you want to keep using that software. This happens ALL THE TIME with CRM systems and email software, and restaurant point of sale systems and ecommerce software. So on that note, let’s just take an example and Let’ me explain with an exact situation that a client of mine had where it required 2 payment gateways. 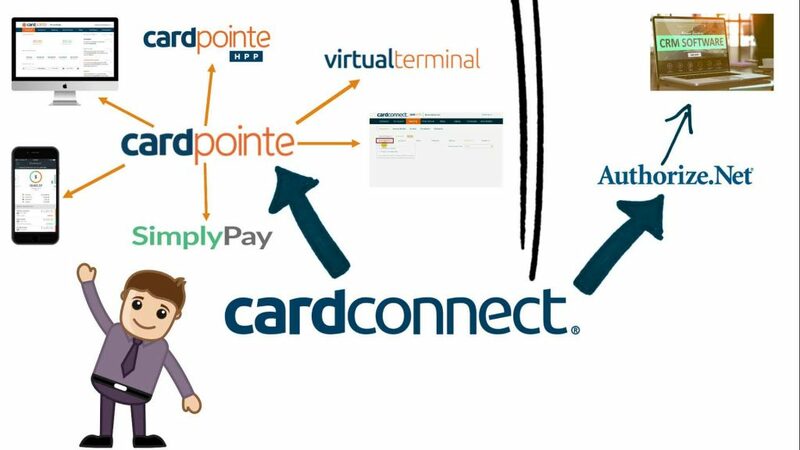 So it starts with a CardConnect merchant account in this scenario and the use of the CardPointe platform and a lot of the digital software tools that come with CardPointe. With this system, he was using the CardPointe virtual terminal to run transaction from customers that he has invoiced. So he had his CardConnect merchant account and his CardPointe gateway and he was really used the system and liked the process. Then, there was an opportunity for his company to become a direct supplier for a national company that required integration into a custom software where direct payment to him was part of the process. Now, the problem at first glance was that CardPointe was NOT one of the listed gateways with this custom software. And here’s where the 2nd payment gateway enters the picture. He set up an Authorize.net account as an add-on to everything that he already had set up, and he was still able to use his CardPointe gateway and all the services that come with it. So problem solved with the addition of a 2nd payment gateway integration to his merchant account. Since he was using CardPointe for all reporting, all transactions that come into his cardconnect merchant account, show up in the reporting tab on the CardPointe dashboard. And Authorize.net is over here in a parralel heigherarchy to CardPointe virtual terminal and gateway, and that CUSTOM software is talking exclusively with authorize.net. Because of this there was not much need for him to ever log into the Authorize.net gateway account interface because everything flows through to CardConnnect and shows up in the reporting dashboard in CardPointe. So What if I needed to add a 3rd gateway? You’d just add it on over here as long as it is compatible with your merchant account, AND the software you’re trying to connect it to, it will work and you can have parallel payment gateways integrated into your single merchant account. On a side note, the use of ONE payment gateway with multiple merchant accounts is ALSO possible. So instead of having multiple Payment gateways linked to ONE merchant account, you can use multiple merchant accounts linked to ONE payment gateway. It’s called load balancing and it is possible with Specific Gateways and is a topic for another video that I’ll have linked in the description. Please share this video with a friend or colleague and give this video a thumbs up. If you have a question about the payment a gateway Your using, leave a comment below.